Join your exclusive host and author of the No. 1 New York Times-bestselling OUTLANDER series, Diana Gabaldon, for a week on the Rhine River. With 35 million copies in print in 43 countries and 39 languages, Ms. Gabaldon’s OUTLANDER series has added to the storytelling tapestry of our lives while also inspiring travel with her literature. Her award-winning series on STARZ has brought to life the backdrops of Scotland, North America, France, Germany as well as dozens of destinations across the globe. Join us for this special departure with Diana Gabaldon, an inspiring storyteller sharing an inspired cruise–and daily excursions–with an intimate group of her fans. Your Avalon river cruise on the Rhine and Rhône rivers actually begins with a night in Marseille. From the shimmering waters of the Mediterranean, you’ll travel to Port-Saint-Louis to board your Avalon Suite Ship®. You’ll enjoy a guided walking tour of Arles-the city in Provence which inspired works by Vincent van Gogh. 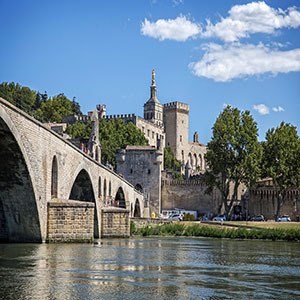 Cruise to the picturesque Avignon for a sightseeing in the fortress city, sail to the charming village of Viviers to see the Romanesque cathedral and historic Old Town. The Saône and Rhône Rivers meet in wonderful Lyon. Explore this city, joining a guided sightseeing tour. Join a transfer to Basel to start your Rhine River cruise. Enjoy a Black Forest excursion, before sailing to Strasbourg, France, and follow the Rhine on to Mainz and Rüdesheim to sail through the stunning views of the Rhine Gorge on your way to Koblenz. Cruise to the Rhineland’s capital city of Cologne and choose between a guided city walk of Cologne, and see its magnificent gothic cathedral, or a walking tour of the city’s notable Jewish heritage sites. Your cruise continues into the colorful city of Amsterdam, where you’ll explore the Netherland’s capital city with a canal cruise, before traveling via high-speed train to Paris, where your Monograms vacation package of 2 days each in Paris and London begins, including guided sightseeing and helpful onsite support from expert Local Hosts® in both these exciting cities.